Dorsett Marina Marine-Grade Vinyl Flooring - Sheet vinyl flooring goes over wood, fiberglass, or metal and withstands abrasions and the elements. Material comes in 6 ft width and can be ordered in 3 foot increments up to 12' continuous length. Order quantity of one for each 3' of length..
Trac Outdoor Fisherman 25-lb Saltwater Anchor Winch - Suggested for boats up to 20' in length, the Trac® Electric Anchor Winch offers simple, smooth operation, providing outstanding holding power when used with river or mushroom anchors. Trac's Fisherman 25-lb. Anchor Winch features a high-efficiency 12V gear motor that uses less battery power than conventional winches. Also included are stainless steel assembly hardware, pre-wound braided rope, an automatic resetting circuit breaker, a sealed membrane Up/Down switch, 14-gauge battery wire, and an anchor safety chain. Bass Pro Shops E-Z Siphon - Self-priming pump, ideal for transferring fuel for boats and automobiles. Anti-static feature lets you transfer fuel without danger of sparks. 1/2" diameter, 6' hose. Manufacturer model #: EZ-08..
Slide Anchor Box Anchors - Slide Anchor's state-of-the-art Box Anchors are compact, hassle-free anchoring systems that boaters and anglers alike can count on to hold firmly in any water depth, bottom conditions, swift currents or severe weather. With no heavy chain to bog down small boats and no powering down required, simply toss the Box Anchor in the water and seconds later the anchor's fixed scoop design and narrow panels set like a cookie cutter into sand, mud, grass or rock. Bass Pro Shops 12V Chrome Plated Power Socket - This Chrome Plated Power Socket provides a handy electrical outlet for plug-in style 12V accessories and emergency lights. Socket includes attached cover for protection against moisture when not in use. Requires a 1-1/16'' installation hole..
Bass Pro Shops Heavy-Duty Hull Cleaner - Quickly and easily remove scum lines, water stains and rust from your boat’s hull with this Bass Pro Shops Heavy-Duty Hull Cleaner. This Hull Cleaner’s wipe on and rinse off formula ensures you spend less time cleaning and more time enjoying your boat. Plus, the Hull Cleaner does not contain harsh acids or chemicals that can harm the paint or sealant. 32 ounces..
Bass Pro Shops Twisted Nylon Dock Line - This three-strand Twisted Nylon Dock Line from Bass Pro Shops offers the high stretch qualities required to absorb shock loads. Constructed to deliver maximum durability, our professionally spliced Dock Line is more abrasion resistant than other rope, will not rot, can be stored wet, remains flexible and withstands most chemicals, mildew, gasoline and oil. Spliced with 12'' eye. Color: White. Imported..
Kwik Tek Life Line Rescue Throw Bag - You'll be amazed how easy it is to throw this 50-foot rescue line to a swimmer in trouble. Kwik Tek's Life Line hangs from your boat rail by an integrated strap with side-release buckle, making it easily accessible at all times. Easy-to-understand directions with graphics are printed on the outside. The Rescue Throw Bag is constructed of bright orange UV-resistant 600-denier polyester, and works great for snowmobiles on lakes, too!Manufacturer model #: LL-1..
Meguiar's Flagship Premium Marine Wax - Meguiar's Flagship Premium Marine Wax delivers a fresh new look to your boat by dramatically enriching color and shine of fiberglass and gelcoat surfaces. Flagship Premium Marine Wax is effective at removing light oxidation and dullness, while restoring the glossy finish and increasing protection from harsh UV rays. Meguiar's Flagship Premium Marine Wax should only be used after the surface has been cleaned. 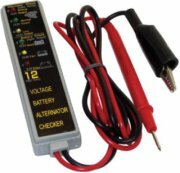 16 oz..
Bass Pro Shops 12V Battery and Alternator Tester - Accurately measure the remaining charge of your 12V battery, or check the output voltage of your alternator with our 12V Battery and Alternator Tester. 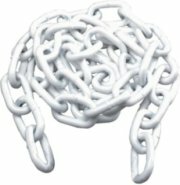 This convenient handheld device features an easy-to-read LED indicator and easily fits inside your coat pocket, tackle box or boat’s glove compartment..
Bass Pro Shops Coated Anchor Chain - These Coated Anchor Chains are coil-proof and coated with a polymer for added rust and scratch protection. Chain attaches between the anchor line and the anchor and is recommended for use with all fluke-style anchors. 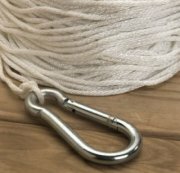 Each chain includes two galvanized anchor shackles..
Bass Pro Shops Heavy Duty Boat Soap - Bass Pro Shops® Boat and RV Care Products. Professional-grade care products at a substantially lower price. Whether cleaning your deck or protecting your upholstery from harmful ultraviolet rays, our unmatched selection will easily meet your every need. Concentrated for maximum cleaning power, the Bass Pro Shops® Heavy Duty Boat Soap is an all purpose soap designed to clean the entire boat. The biodegradable formula will not remove wax or polish and works in fresh or salt water. 128 oz..
Bass Pro Shops One Step Fiberglass Cleaner & Wax with PTEF - Bass Pro Shops® Boat and RV Care Products. Professional-grade care products at a substantially lower price. Whether cleaning your deck or protecting your upholstery from harmful ultraviolet rays, our unmatched selection will easily meet your every need. The Bass Pro Shops® One Step Fiberglass Cleaner & Wax with PTEF® restores oxidized chalky fiberglass fast and seals restored surface with UV-blocking PTEF® polymers. 32 oz..
Bass Pro Shops Open Base Nylon Cleats - Extremely durable, open-base Black Nylon Cleats have a textured surface. Excellent for boats or docks. Two mounting holes. Mounting hardware not included.4-1/2" -Requires two #10 screws (not included).6"-Requires two 1/4" screws (not included)..
Bass Pro Shops Solid Braid Nylon Anchor Line - Solid-braided construction maintains therope’s round shape throughout the length ofits service life. Strong, soft and lightweight—works well in pulleys. Great for general use.125-lb. tensile strength. 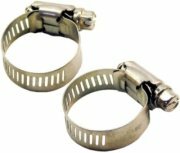 Imported..
Bass Pro Shops Stainless Steel Hose Clamps - Corrosion-resistant 316 stainless steel hose clamps install easily with a flat-head screwdriver for secure hose connections. Clamps adjust to accommodate various hose sizes. 2 pack..
Deck Rite Vinyl Marine Floor Coverings - This MariDeck by DeckRite is an attractive, durable vinyl alternative to traditional high maintenance marine carpet. MariDeck can be installed on wood, fiberglass or metal surfaces making it ideal for pontoons, aluminum fishing and hunting boats, ski boats and houseboats. Embossed with a slip-resistant textured surface, MariDeck Vinyl is easy to maintain--cleans up with just a spray of water. Made in USA. 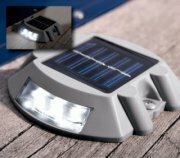 Order by linear foot with a minimum of 15’ length per size and color..
Dock Edge Solar Docklite - This Solar Docklite by Dock Edge is the ideal way to light up trouble spots on docks, decks, pathways, even transition areas. Just install several Solar Docklites in places where footing becomes problematic to help your family and friends navigate with ease. Low-profile design features extended-duty solar-charged batteries that charge during the day, light up automatically at dusk, and last all night for worry-free convenience. Color: Gray. Weight: 0.8 lbs. 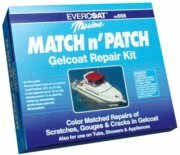 Fiberglass Evercoat Marine Gelcoat Repair Kit - Permanently repairs nicks, gouges, and scratches in fiberglass hulls and decks. Cures glass-hard in one hour! No sanding needed. Kit includes colors, polyester gel paste, hardener, release paper, mixing sticks, blending chart, and instructions..
Orion 12-Gauge HP Red Aerial Flares - Orion® HP Red Aerial Flares fly up to 500 feet and burn up to 16,000 candlepower with an average burn time up to seven seconds. USCG approved for day or nighttime. 4 pack. Manufacturer model #: 539..
Pelican i1015 Case - The Pelican i1015 iPhone® Case is designed for the iPhone, iPhone 4, and iPod Touch®. External jack allows full use of the iPhone/iPod Touch microphone and volume controls. A built-in cable manager holds earphones and cables. Included is a sport carabiner that secures the i1015 to a backpack or belt loop. There is also an easy open latch, a rubber liner that doubles as an O-ring seal, and stainless steel hardware. 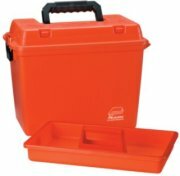 Plano Dry Storage Boxes - Plano's Dry Storage Box features a watertight O-ring seal around the lid to help seal out rain and moisture, an easy-access storage compartment for small, frequently used items, and a comfortable overmolded carrying handle. The 15''x8''x10'' and 15''x10.4''x13'' sizes also include an internal lift-out tray..